The Parkway Group serves as the umbrella body for trail focused groups along the Clutha Mata-Au. We are working with community groups including the Clutha Gold Trail Trust, and the Upper Clutha Tracks Trust, to advance the river-length trail. The Mighty Clutha River Trail is part of our larger river parkway project. The majority of the above expressed support for the river parkway and trail in principle. The Department of Conservation determined that the river parkway and trail project is consistent with the Otago Conservation Strategy, 1998. A Clutha River Parkway Steering Group was formed in October 2003. The Steering Group is an Incorporated Society with Charitable and Donee Status. The Steering Group contracted a leading multi-disciplinary consultancy, GHD Ltd, from mid 2004 to late 2007, to oversee the first phase of the project. This included a series of consultation meetings in towns and communities along the river, liaising with stakeholders and landowners via a landowner database, and a river corridor Landscape Study to define the 'Parkway', examine degradation issues, collate inventories, and identify mechanisms to protect and enhance the natural, recreational and cultural values of the corridor. Recreation Study, defining the potential of the Parkway and Trail. Statutory Report, examining appropriate and effective statutory protection mechanisms. Clutha River Trail Establishment Plan. Promotion of stakeholder participation in the Steering Group, which in the long-term may form the nucleus of a statutory Parkway Authority, Trust or Commission. Research into further funding and completion of grant applications. Identification of projects and initiatives that will involve the community in the Parkway, such as trail development, ecological restoration, historic site restoration, access and trail improvement, eco tourism and heritage tourism opportunities, outdoor education/school programmes, and multi-sport events. Promotion of stakeholder and public participation at all levels. Overseeing of contracts and budgets approved by the Steering Group. The Ministry for the Environment supported the first phase of the project through the Sustainable Management Fund. The Central Lakes Trust and Lotteries also funded the first phase, which focused on foundation studies such as Landscape, Heritage and Ecological Studies. The Queenstown Lakes District Council and the Central Otago District Council are assisting directly, and are liaising with the Clutha District Council, and the Otago Regional Council. In April 2009, Contact Energy proposed major hydro dam development, threatening the Parkway project. 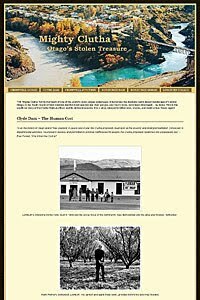 In October 2009, the Parkway Group facilitated the formation of the Clutha River Forum, an alliance of river and conservation groups opposed to further "think big" dams on the Clutha Mata-Au River. 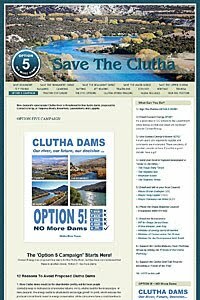 The Forum launched the 'Option 5 - No More Dams' campaign. The Clutha Mata-Au River Parkway is a nationally important conservation project in response to extreme development pressure, along the entire river. The second phase of the project is focused on the development of the Mighty Clutha River Trail. Trail work and consultation is ongoing, and new community groups (Clutha Gold Trail Trust, Upper Clutha River Guardians) have joined the Parkway Group. The Parkway Group will continue to expand its stakeholder base. The Clutha River Parkway Newsgroup has over 250 members, including all known stakeholders. Feedback from the newsgroup indicates enthusiastic interest and support. 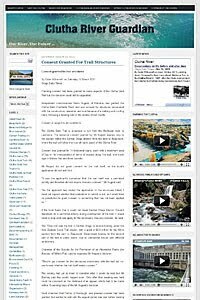 Become a Friend of the Clutha River Parkway and receive updates on progress.